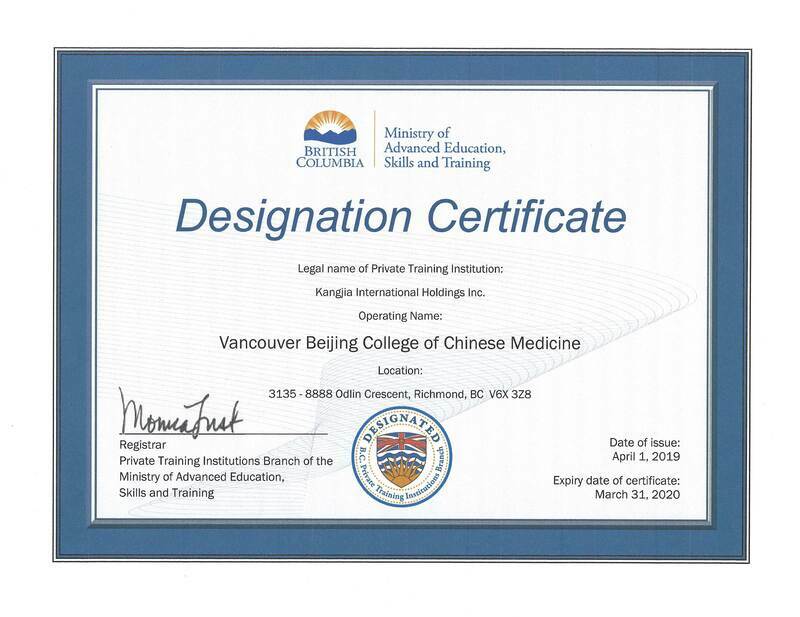 Vancouver Beijing College of Chinese Medicine has been named a “best value” TCM school. Our college is a accredited college by PCTIA and CTCMA. Our programs and education have all approved by PCTIA or CTCMA. All of our students pursue the combination of a TCM theory and clinical experience during an internship. We have the best Dr.TCM in our clinical. We won’t let you leave without TCM clinical experience.You can go anywhere with your TCM knowledge during all your life after you graduate from our school. Our graduate practice everywhere from Richmond to BC, from Canada to anywhere in the world. 3. You will receive financial assistance easily. VBCOCM recognizes that TCM education is an important lifetime investment for each student. Thus, we are committed to ensure access for all highly qualified candidates and to helping them obtain resources for financing a TCM education. 4. You can go anywhere with your knowledge during all your life. You can go anywhere with your TCM knowledge during all your life after you graduate from our school. Our graduate practice everywhere from Richmond to BC, from Canada to anywhere in the world. 5. We will mentor you. From the beginning, we pair you with mentor, teachers or graduate, who can offer wisdom from having recently navigated TCM school. As a student, you will also study with a faculty mentor who can provide the guidance of theory and clinical experience. 6. Our professors are outstanding teachers who will be your good teachers and friends. Our teachers include TCM or West Medicine all are a graduate from the TCM or West Medicine University in China, most have the BC Dr.TCM, R.TCM.P or R.Ac Licence. They have plenty of experience of Theory and Clinical knowledge. Excellent teaching is a priority, and our students rave about their professors. Faculty are readily available for questions and conversation, mentoring, and advice on courses and careers. Personal and professional connections last long after TCM school graduation. 7. Our students are interesting and diverse. Our students include West Medicine Doctor and professor, Computer operator, business executives, community activists, teachers, and health care professionals, etc. While some are just out of college, others are embarking on a major career change. They are friendly and cooperative. Students regard one another as colleagues and partners and as part of a lifelong network, not as competitors. 8. We give you options- Full-time and Part-time Options. provides the flexibility that many of our students are looking for. Knowing that flexibility in life is important, we want to make it possible for students to be able to balance school with work, family, or other responsibilities they may have. We offer the flexibility of part-time and full-time programs with day and evening courses. After your first year, you can easily switch programs. This means you can graduate in as little as two years (24 months), two-and-a-half years or stretch things out to more than the traditional three. 9. You will LOVE where you live and study. Richmond is a beautiful and progressive city. It is located near both airport and the ocean—with food, recreation, and entertainment options that abound. And our campus is nestled in the center of Richmond for a unique learning environment. We offer the flexibility of part-time and full-time programs with day and evening courses. After your first year, you can easily switch programs. This means you can graduate in as little as two years (24 months), two-and-a-half years or stretch things out to more than the traditional three. If you want to know further information, please contact us or visit StudentAidBC at www.StudentAidbc for more information.